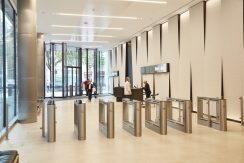 PRODUCT: EasyGate DG SECTOR: Grade A Office CLIENT: Bird & Bird LOCATION: London 12 New Fetter Lane is a modern office development located in the City of London. The building offers 147,000 square feet of Grade A office space across 12 floors. 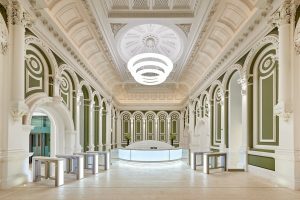 The building is a stunning example of modern environmentally friendly design having been awarded a BREEAM ‘Excellent’ rating. 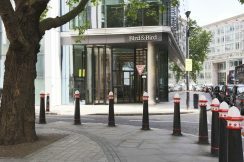 The building is the new London headquarters of international law firm Bird & Bird as they look to grow their operation. 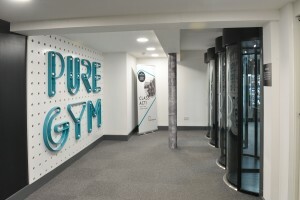 As part of the building’s fit out, dedicated client spaces have been provided to create a welcoming environment for clients and international visitors to relax and work in whilst they are in London. The building’s modern office space has been designed to encourage collaborative working between staff. Due to the high number of employees and visitors entering the building on a daily basis, a security solution was required that would be able to cope with the high level of footfall whilst creating a secure line to the building to prevent unauthorised access. 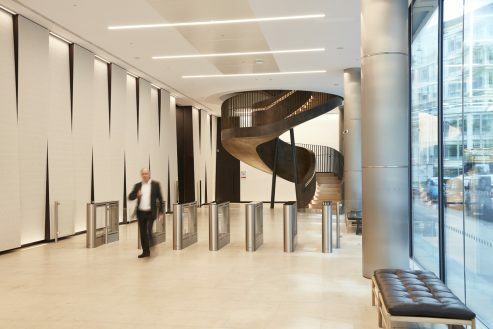 Experienced in providing secure access to Grade A offices Meesons were approached to provide a solution to prevent unauthorised access and mitigate risk. 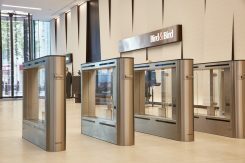 Based on the client’s specification Meesons proposed the EasyGate DG Speed Gate with a brushed stainless steel finish and black glass top lid to provide a modern look to complement the design of the reception area. 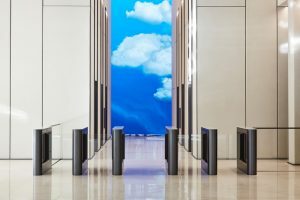 To manage the high number of staff using the building Meesons installed six lanes of EasyGate DG, consisting of five single wing passage lanes and one dual wing passage lane for wide access. Due to the high number of clients visiting the building and passing through the Speed Gates, visitor card collectors were required. Integrated into six of the Speed Gate cabinets and each with a capacity of 150 cards, the visitor card collectors ensured a high level of daily visitors could be efficiently managed. 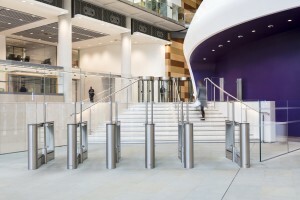 The client also specified that the Speed Gates should be controlled from a central location to enable reception and security staff to operate the Speed Gates as required. Meesons were able to provide controls for the Speed Gates at each of the three lecterns located at the front of the reception. 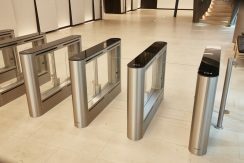 Meesons also integrated the Speed Gates with remote control fobs for the security team to be able to control the barriers from anywhere within the reception. 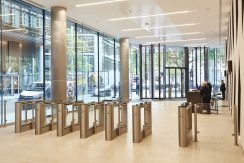 The low power consumption of the EasyGate DG Speed Gates provided an ideal solution to complement the building’s sustainable and energy efficiency targets.